Wood engravings with embossment, the complete portfolio of 12, all fine, fresh impressions of the only know state, the full sheets, printed on custom Twinrocker handmade cotton paper, with margins, each signed, dated and numbered in pencil by the artist, executed in an edition of 36 (there were also 5 APs, 4 PPs, 2 TP, 1 HC and 1 BAT), printed and published by Two Palms Press, New York, in fine condition, lacking the original portfolio case. Munich, Staatliche Graphische Sammlung München, Terry Winters Prints: 1999-2014, 18 December 2014 - 01 March 2015 (another example). Humlebaek, Louisiana Museum of Modern Art, Terry Winters Prints: 1999-2014, 18 June - 30 August 2015 (another example). 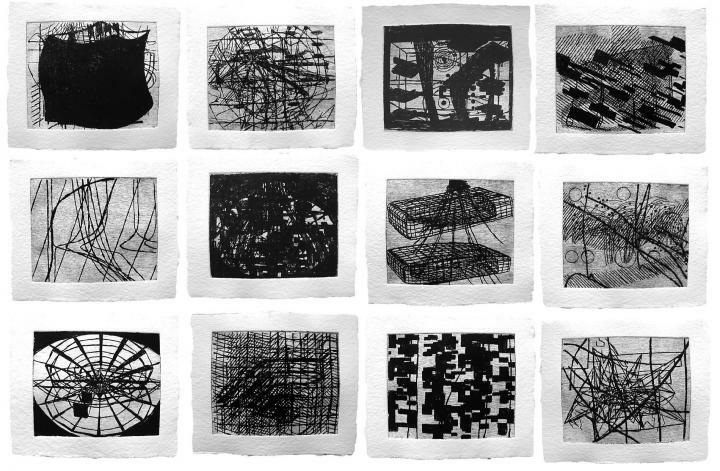 Waterville, Maine, Colby College Museum of Art, Terry Winters: Printed Matters, 12 February - 10 May 2015 (another example). Finch, Elizabeth and Michael Sernff with a contribution by Francine Prose. Terry Winters Prints 1999-2014, The Complete Editions. 2014, Staatilche Graphische Sammlung München, Colby College Museum of Art and DelMonico Books, pp.44-45 and p.116, nos.12.01-12, illustrated (presumably another example).